Coastal erosion is a natural phenomenon when waves and currents remove sands from the coastline. Hence, the beach land mass will shift or even reduced. In Malaysia, beach erosion issue is at an alarming state. 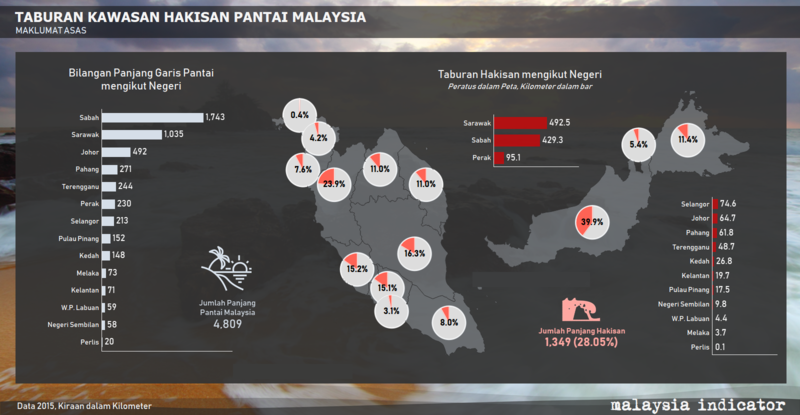 28.05% of beaches in Malaysia are affected by erosion, according to the data from Malaysian Government. The total length of beaches in Malaysia is at 4,809 km, while 1,349 km are affected. Beaches in East Malaysia suffered the most from coastal erosion, but it is also because those states have the longest length of beaches in the nation. On the other hand, Perak beaches is the third most eroded, despite ranking at number six in the total length of beaches by states. In November 2018, The Star reported on coastal erosion phenomena at Pantai Puteri, Melaka. It was suspected that land reclamation is the culprit behind the incident. Therefore, the government should look into this issue sooner rather than later, before the current Malaysia beaches’ condition got worse.